Bug In Your Soap are In The news! Well I have survived the New York Gift Show. It was long and very busy. Update on the show will be posted early next week as soon as I get everything organized. So many buyers so much interest! Well here is the latest. 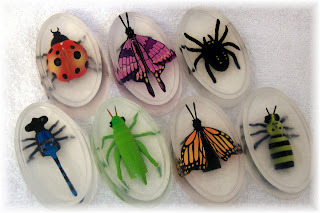 Just Bubbly Bugs In Your Soap is this weekends featured product at NeatoStuff.com - a very cool and exciting website featuring unique upscale gifts and personal items. Check it out if you get a chance! You would imagine that after all these years (24 to be exact) of exhibiting at the New York Gift Show that I would be used to the dire heat in the Javits during setup. Once again- true to form it was at least a hundred degrees in the Javits Convention Center today while I was designing and setting up the booth for the summer New York International Gift Show. Despite the heat and non circulation of air I was able to once again display all the fun and unique handcrafted soaps and bath creations that the retailers have come to buy for the upcoming holiday season. In addition to the ever favorite seasonal soaps like our Gingerbread Man soap and our Candy Cane Designer Soapsicles we will once again be showcasing our Halloween Seasonal Soaps including the scrumptiously scent packed Pumpkin and Ghost Soaps, Candy Cane Soapsicles, Monster Mash and Halloween Monster Ducks! So if you are in the neighborhood of Booth 1753 stop on in and say hello! I'll be there from Sunday through Thursday meeting and greeting all my wonderful and loyal customers. Well after months and months of waiting and planning and painting and working it is finally complete. Our new shop! It is wonderful. It is spacious. It is quiet and heavenly. 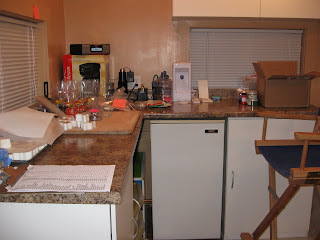 We have designated stations, windows, cabinets for storing, stainless steel tables, above head storage and even a fridge. Above is a view of my creation station. 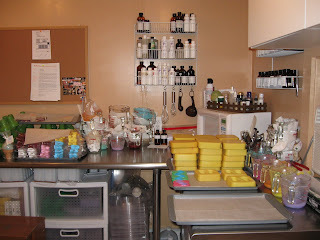 Below is the packaging station where all our soaps are carefully bagged and tagged, then shipped to you. 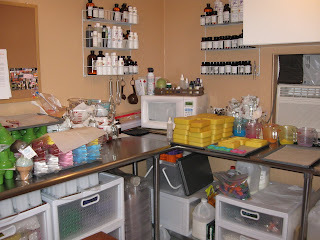 Also below is the creation station where all the wonderful Just Bubbly goodies are made. Considering that we spend 12 hours a day - every day in here I guess it is my home away from home!